1) Take a vacation and go somewhere with lots of sunshine and do not cook for a week. (Spoiler: we’re on holiday right now and I’m writing this under an umbrella in the sun and loving the fact that someone else makes my breakfast. lunch and dinner. #grateful). Cooking at home becomes so much more inspiring when you spend some time away. 2) If / when option 1 is not realistic, grab a bunch if vegetables from the store and make something ethnic. The flavors of thai, moroccan, or for example nepalese food taste great in the depths of winter. 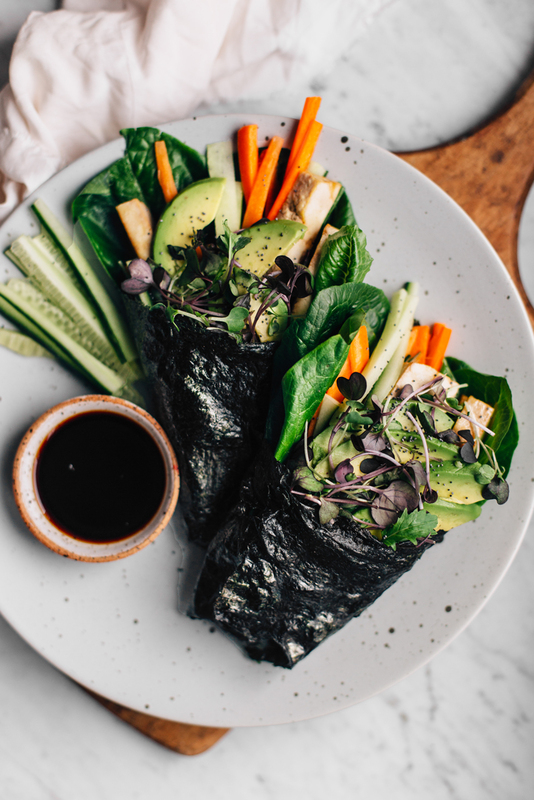 Or if you’re in the need for something fresh and easy, try these no-rice nori rolls! They’re the perfect little thing to satisfy your sushi cravings without all the fuss of cooking the perfect rice. And also, eating your daily dose of veggies is a lot more delicious this way. But a word about these sushi rolls (or pockets?). If we’re being specific, these have very little to do with traditional sushi, as there’s no rice involved. 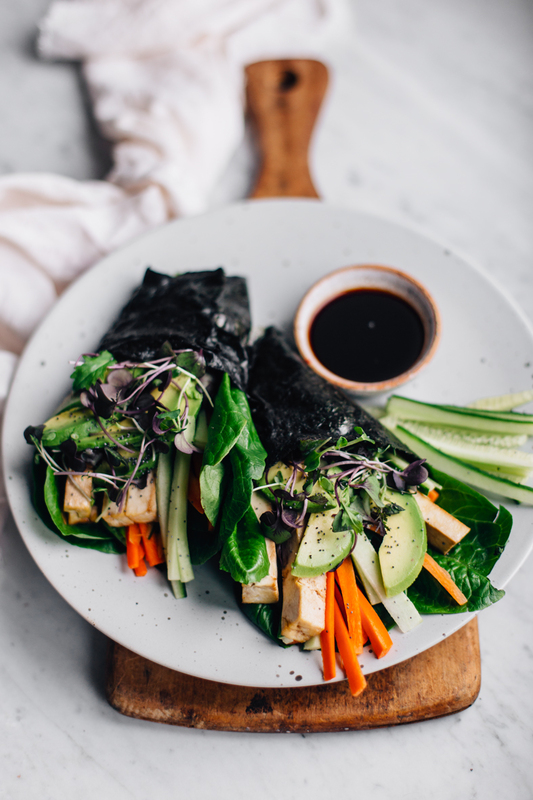 Being the lover of convenience as I am, cooking up the perfect sticky rice seemed like too much work, so I just wrapped a bunch of colorful veggies and some oven roasted tofu into nori wraps, dipped them in tamari, and ate them with a satisfied grin on my face. So easy, yet kind of sophisticated, and totally not anything like my mashed potatoes. Yesss. notes: you can always add your favorite veggies in here, or some rice if you like. a creamy dip with tahini would probably be divine too. 1. Start by making the tofu. Preheat the oven to 200 C / 400 F degrees. Wrap the tofu in some paper towel and place it on a plate. Put another plate on top of the tofu and place something a bit heavy on top for about 15 minutes to remove excess liquid from the tofu. 2. In a medium bowl, mix all the marinade ingredients together. Cut the tofu into a long strips gently turn the strips the pieces in the marinade. Place the tofu on a baking sheet covered with baking paper and bake for about 10 minutes, or until the tofu is slightly browned. 3. In the meantime, prep the vegetables. Peel the carrots. Slice the carrots, cucumber and avocado into thin long slices. 4. Once the tofu is ready, assemble the rolls. Lay out the nori sheets and turn it on a diagonal. Place the romaine salad, sliced carrots, cucumbers, avocado, and tofu in the center. Add some microgreens on top. 5. First fold up the bottom and then fold the sides across. You might need to wet the sides of the wraps so that they will stick together. Hold on for a minute so that the roll stays in shape. Serve with some tamari, and enjoy! Tagged grain free, lunch & dinner, vegan, vegetables, vegetarian. When you're in the mood for something fresh, healthy, and delicious, try this Green Power Smoothie with Chia! Super simple, yet just the right amount of fancy. Yum! Yum! Yum! This looks so tasty! Definitely want to try this! Can you please explain what you mean by ‘kitchen paper?’ This is not something I’m familiar with, perhaps it has a different name here in the United States! Thank you! Great recipe Tuulia! I so needed something new and healthy to up my dinner game….I feel you about the creative rut! Now I’m going to write a shopping list cause I need some nori wraps to make your recipe.